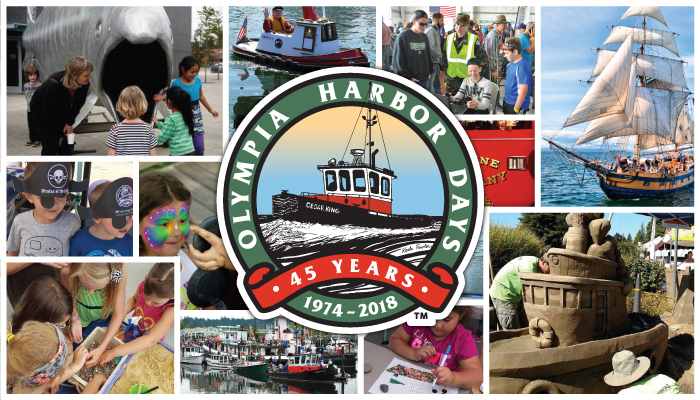 OLYMPIA, WA, August 25, 2018 /24-7PressRelease/ — It’s a race to the finish as final plans set the course for Olympia Harbor Days Vintage Tugboat Races and Festival, South Sound’s largest and free maritime festival at the Olympia waterfront, August 31 – September 2, Labor Day weekend. The award winning event is presented by the Olympia Kiwanis Club with title sponsor the Squaxin Island Tribe. “Every year I have so much fun making the festival even better by adding more fun for kids and adults to create lasting memories for the whole family,” says Executive Director Carol Riley. The Tugboats are coming, the Tugboats are coming! It is all about the Vintage Tugboats of the Puget Sound. Tour over a dozen vintage tugs on Saturday and watch the World’s Largest Vintage Tugboat Races on Sunday in the deep channel of Budd Inlet. Be sure to tour the WWII History Museum aboard retired US Coast Guard Cutter Tug Comanche. And find not 1, not 2, but 3 mini tugs on display and as they compete in a Mini Tug – Tug ‘o War. The Squaxin Island Tribe will turn the Port Plaza into the Squaxin Island Salish Seaport featuring a beer garden, salmon bake, tribal art, cultural activities, and a tribal canoe race followed by tribal jamming with drumming and dancing. Rock out to the tunes of Seattle’s band The Popoffs every evening on the Seaport Stage. On Saturday Kids can create a “Salmon-Bot” with staff from Olympia’s Hands On Children’s Museum. At Percival Landing stroll the hundreds of arts, crafts and commercial vendors. Percival Park continues as home to Washington’s Lottery Main Stage featuring a mix of area classic rock bands and talented musicians. New this year: America’s First Corps 5-Man Jazz Combo, The Budd Bay Sea Shanty Singers, and the River Ridge High School Taiko Drumming Ensemble. And find the inner pirate in you – join the Procession of the Pirates Samba Olywa style on Sunday. Kids dressed as pirates can search for a prize in our treasure chest located at the Harbor House! Enjoy the magnificent “Ships of the Harbor” sponsored by Capital Heating & Cooling. Cruise on a steam ship. Sail on a tall ship! Tour historical ships and yachts including the Navy’s Admirals Barge the Old Man IV and a 100 year old Bering Sea. ONE DAY ONLY – FIN, a 25 foot Salmon, will arrive Sunday on Columbia street. Kids – take off your shoes and climb into the mouth of this steel salmon and find a world of art, cultural history, a waterfall and learn the salmon life cycle. Olympia Harbor Days is a not for profit free community festival presented by the Olympia Kiwanis Club whose mission is to help children and families in need. The festival takes place every Labor Day weekend on Olympia’s Waterfront. Donations are welcome. Go to www.HarborDays.com for more details.